Hello from Jennifer and Ariane, your friendly Drupal Documentation Team co-leads! It’s time for a quarterly update on what’s happening in the Documentation Team—we've been working on some major restructuring of documentation and the Docs Team since our last update (June 28, 2011), and we'd like to get you up to date on our plans, and other events and news. The current documentation has many features of a wiki: anyone can edit most of the pages, and anyone can add new pages... Yet we have found that potential documentation contributors are timid about actually editing and adding pages. So what we would like to do is turn responsibility over to the community as a whole, and make it abundantly clear that everyone can edit and contribute. The plans have been solidified on this issue: #1278256: Develop a plan to make it more clear that the current Documentation on drupal.org is community maintained., and if you'd like to help with the infrastructure changes (site building and module development), we are currently coordinating docs infrastructure work on http://groups.drupal.org/node/174499 . Follow-up changes to the infrastructure are being discussed on #1287784: Follow-ups to improve the community docs. Once we have those changes deployed, the next idea is to start a new section of documentation that will be more directly curated and maintained by the official Documentation Team leadership—and therefore, more limited in scope. The idea here is that careful decisions will be made about what are the "essentials" that belong in this documentation (which might be called "official documentation" or "user manual" or "curated documentation" or "essentials" or ...), and a small team will be responsible for maintaining the documentation. This idea has not been completely fleshed out yet; it's being discussed on issue #1291058: Make a curated docs section if you'd like to join the discussion. Another idea that's in development is to make it possible to search external documentation—for instance, Drupal tutorials on blogs, and curriculum on Drupal company web sites. Lin Clark is currently exploring ideas for automatic collection of posts involving RDFa/microdata and SPARQL, and there will hopefully be more ideas and discussion about this in the next few months. Watch the Documentation Team on groups.drupal.org for updates! At the end of August, many from the Docs Team were at DrupalCon London. We had BoFs ("Birds of a Feather" informal discussions) about DITA (a standard for documentation), the proposed new Help system for Drupal 8, and Lin Clark's ideas about using RDFa or microdata to build an index to documentation from Drupal Planet (see above). We are holding weekly "Documentation Office Hours"—one-hour IRC meetings on Tuesday afternoon (North American time), open to anyone for questions and discussions about contributing to documentation. It seems like it's been very helpful to have a definite time when people can find us on IRC, and we plan to continue with this schedule for the foreseeable future. The API documentation on api.drupal.org has been improving slowly but surely over the past couple of years (I think/hope). But there are still quite a few areas where the documentation does not conform to the API documentation standards. Unfortunately, patches that do wholesale changes to documentation headers are disruptive to the ongoing improvements of the Drupal code, since they often require that many patches be "re-rolled" so that they will apply to the new code-base. So, we've been told several times that we needed to postpone these types of large-scale updates. However, in early November, a patch is scheduled to go into Drupal 8 that will move all of the core Drupal files into a "core" directory. This will be a huge disruption, as every patch for Drupal 8 will need to be re-rolled. Because of this, it's a great time do other disruptive work, and we plan to have an API Documentation sprint just after that patch goes in, where we'll do a defined set of wholesale improvements to the in-code docs for Drupal 8. Mark your calendar—I'm hoping that we have lots of participants (including new API docs contributors) so the work for each person will be manageable! At DrupalCon Chicago, Dries suggested that in Drupal 8 development, each change would have to pass through a series of "gates" in order to be accepted, and Documentation was listed as one of his "gates", but it wasn’t defined what the gates really meant. So, a conversation was started with Jennifer, Angela Byron, and other members of the community, and in July, the Documentation gate standards were adopted. The adopted gates are listed on the gates page. That's all for now—we hope that your fall (or spring, if you're in the Southern Hemisphere) goes well, and we'll be in touch! It's official, and now is the time to register for not just a noteworthy event, but your opportunity to connect with a world-wide community using Drupal to collaborate, connect and improve our online experience. Go ahead: register now! DrupalCon is exciting - there is something for everyone, whether you are already using Drupal or considering it for your online needs and want to know more. Expect to learn about the future of open-source content management; to see what unique tools and features developers are using for fields such as commerce and mobile development; to talk with and hear about high-profile operations using Drupal; and most of all, expect to be surprised by how much fun you will have in the process! Drupal is coming to Denver, and the Colorado Convention Center is officially home to DrupalCon Denver on March 20 to 22, 2012. This conference is your chance to engage the community, learn from others, and share your experiences. Training sessions will be available before the conference on March 19th and a code and contribution sprint on March 23rd. Get your tickets early. Pricing for registration starts at $350 per person, and late pricing begins February 21, 2012 at $400. Volume tickets are available - just use the "Purchase Vouchers" link found on the registration form. Discount pricing is available for students, non-profit employees, and "Sprint Leads" - to register with a discount, you will need to visit denver2012.drupal.org and apply for the specific discount you wish to receive separately. Discount registration applications will be available starting September 15, 2011. Keep DrupalCon 100% powered by You and Submit Sessions Online! We want to hear your ideas for interesting topics and timely discussions for DrupalCon Denver - session proposals are still being accepted until October 26, 2011 23:59:59 UTC/GMT -7. Don't wait - use our online form to submit your session, and see what sessions have already been proposed. This year's theme is "Collaboration for All Devices" and you can read more about the different tracks that will be represented at DrupalCon Denver on our website. We are confirming new speakers regularly, and your one-stop resource for the latest on who is stopping in Denver is denver2012.drupal.org/featured-speakers. See the new faces just added this week, and don't forget to follow @drupalcon or find us on Facebook. git.drupal.org is scheduled for downtime, Thursday September 8th at 3PM PDT (2200 UTC). We will be performing standard maintenance on git.drupal.org and its associated services. We expect 20 to 30 minutes of downtime, but are reserving an hour for the maintenance window. Drupal 7.x is being maintained, so given enough bug fixes (not just bug reports), a new maintenance release will be made available the last Wednesday of next month (September 28). Drupal 7.8 is a bug fix only release. The full list of changes between the 7.7 and 7.8 releases can be found by reading the 7.8 release notes. A complete list of all bug fixes in the stable 7.x branch can be found in the git commit log. Addresses critical upgrade path issue #1164852: Inconsistencies in field language handling. The 7.8 release notes have more information for site builders who hit this issue in Drupal 7.7. Due to stricter error handling in Drupal 7.8 around entities, users of the Media module are experiencing EntityMalformedException errors. A workaround is posted at http://drupal.org/node/1266620#comment-4941950 and engineers are actively working on a new release. Denver, CO is hosting the next North American DrupalCon happening on March 19-23, 2012 at the massive, well-appointed Colorado Convention Center. The worldwide Drupal Community is what makes DrupalCon so fun and exciting, and Colorado's community is thrilled to be the home of "Drupal Elevated" -- tickets go on sale soon, so be sure to follow us on twitter and we'll tell you what's going on, @drupalcondenver. DrupalCon is a world-class conference with a world-wide audience. If you or your organization actively use Drupal, or even if you never have but want to learn, DrupalCon is your chance to engage the community, learn from others, and share your experiences. Sponsoring DrupalCon is a great way to get your message before a targeted audience of Drupal users, developers, businesspeople, and other Web professionals. And, you earn karma points because your investment helps make DrupalCon passes affordable so more community members can attend. Follow Drupalcon Denver on Twitter @drupalcondenver, to stay informed on the latest details! Drupal core needs more eyes and more contributors to decrease the very high amount of unresolved issues. There are currently a large number of unresolved issues in the core queue, and we want to get more organised dealing with the backlog, and encourage new people to help out. Over 2200 open bug reports against Drupal 8 and 7. Over 1750 open bug reports against Drupal 6. Over 500 patches needing review for Drupal 8 and 7. Nearly 200 bug reports against Drupal 6/7/8 have 0 replies. How will office hours help? If you've been wanting to get involved in Drupal core development, but aren't sure where to start, coming to the office hours. You will find experienced contributors who will help you find something to work on. If you have patches or bug reports against Drupal core, and want to get your patch reviewed or figure out where to take the issue next, this should be a good time of the week to trade reviews on IRC. Triaging the core queue - understanding status, priority of issues, closing duplicates etc. Co-writing change notifications for needs work issues tagged with "Needs change notification". Writing SimpleTests for bug reports that don't have them. Have a local environment to review and test core patches. We'll try to make sure at least one person is online during each slot. See the original proposal for more discussion, and to volunteer for helping out with office hours on a regular basis. Comments have been disabled on this post to keep discussion in one place. (#634616) AJAX now responds to 'click' instead of 'mousedown'. Testing was performed to make sure this doesn't affect major contributed modules, but could cause issues. (#1164852) The 'translatable' flag on fields added via the UI now defaults to FALSE, same as fields added via the API do. Contrib modules such as Entity Translation can allow toggling this back for sites that need it. An upgrade path will be included in a future release to bring all legacy fields into compliance. The robots.txt file was changed in Drupal 7 to disallow crawlers from the filter tips pages. #1204648: Tests added for SA-2011-CORE-002 broke testbot causes node access tests to fail, for people running the full core test suite in the Testing module. Fixed in 7.x-dev, and will be included in the 7.5 release. Hello from Jennifer and Ariane, your friendly Drupal Documentation Team co-leads! It’s time for a quarterly update on what’s happening in the Documentation team—we've been trying out some new initiatives and working on infrastructure since our last update (April 5, 2011), and we'd like to get you up to date. In April and May, Ariane tried out a new concept: picking out a few online Drupal.org documentation projects for the docs team to focus on, in the spirit of an agile "sprint" (not to be confused with a day-long let's-all-document "sprint"). April's sprint focused on 5 key Drupal 7 documentation updates, and it was quite successful: many people participated; four of the five documentation goals were completed, and lots of progress was made on the 5th (updating the core module documentation for Drupal 7). May's sprint had a bit less momentum, but many of the April contributors continued on, and some progress was made. Jennifer also made a developer-doc priority for April and May—to finish the theme and module Drupal 6 to 7 migration guides. This task was completed in June. We named June “Bring a Friend to Docs” month, and outlined an easy procedure to ease new contributors into contributing to documentation. If you missed it in June, you’re still welcome to follow the steps on that page—we can always use more contributors! Jennifer and Ariane will both be at DrupalCon London (thanks to the Drupal Association for funding Jennifer's trip!). Keep an eye on the BOF (Birds of a Feather - informal sessions) schedule, and join us for a Documentation sprint on Friday, August 26 (if you can't make it to London, you can join us in IRC on #drupal-docs, probably about 9 AM to 5 PM London time). Jennifer's also (hopefully) co-presenting a Core Conversation about improving the Drupal Help system with Kristof Van Tomme, if it gets accepted. Hope to see you there! Ariane's online documentation sprints will take a vacation for the summer, and are planned to resume after DrupalCon London. It will be business as usual in the Docs issue queue in the interim. If you'd like to host a documentation sprint at your regional camp, local LinuxFest, etc., we have a newly updated guide to hosting a sprint available. There have been several new contributors this quarter making patches for API documentation, which is much appreciated! We’ve managed to get quite a few API doc issues fixed, and are really improving the quality of the documentation. Keep up the good work, team! We have been holding weekly "Documentation Office Hours"—one-hour IRC meetings on Tuesday afternoon (North American time), open to anyone for questions and discussions about contributing to documentation. It seems like it's been very helpful to have a definite time when people can find us on IRC, and we plan to continue with this schedule for the foreseeable future. The Documentation Contributors block is back, and available for your Dashboard, with handy links relevant to Docs contributors. See http://groups.drupal.org/node/154024 for more details. Jennifer has been working on an infrastructure initiative: to announce Drupal code changes as “Change notification” nodes on Drupal.org, using Views and a content type with CCK fields (issue). This will act as a replacement for and enhancement of the current (very cumbersome and hard-to-maintain) Module and Theme update guides, and hopefully help the process of making sure that as Drupal evolves, the documentation evolves with it, as well as making it easier for module and theme developers to keep up with changes. Jennifer is also working with Angela Byron and others to change some other documentation-related aspects of the core Drupal development process. We’ll be announcing the process changes, the Change notification nodes, and other updates as they go live. Jennifer is also hoping to get to some of the other infrastructure and communication issues identified in our December 2010 docs meeting this summer, once the change notification nodes project is launched, so hopefully we'll have some more Docs infrastructure news next quarter! Jennifer is mentoring a Google Summer of Code student this summer, Tamás Demeter-Haludka (Yorirou), who is building a module to do Conditional Text in Drupal, as part of the initiative to make a better help system in Drupal 8. We’ll be having some BOF gatherings and hopefully a Core Conversation at DrupalCon London on this initiative, if you would like to get involved. Monthly Drupal Documentation sprint priorities, announcements, and events are posted on http://groups.drupal.org/documentation-team and on Twitter (@drupaldocs). That's all for now, hope you're having a fantastic summer and that we'll see you in London! This breaks down to 5 tracks with 12 sessions each. The 6th track, Core Conversations, will also have 12 sessions slots available and DrupalCon London will be opening core conversation session proposals between 14 June and 14 July 2011, 23:59 GMT+1. Core Conversations are a place for people actively working on Drupal or Drupal.org to meet and plan the future of Drupal (Drupal 8). We will announce selected Core Conversation sessions on 22 July 2011. We remind you that we have some excellent pre-conference training courses and workshops scheduled for 22 August 2011 and invite you to register for these. This is a great opportunity for Drupalists at all levels of experience to learn from the experts. The cost for a full day training varies from only £150 for the Absolute Beginner's Guide to Drupal to £325 for advanced topics like Building Modules for Drupal 7 and Drupal Powered E-Commerce. Demand for Drupal talent is high, so why not invest in your future! Register now to attend DrupalCon London and for pre-conference training. If you would like to support DrupalCon London and help us spread the word about the conference. Here you can get badges for your website and promote the conference via our Twitter and Facebook widgets. See you at DrupalCon London 22-26 August 2011! Stay up-to-date with the latest information about DrupalCon London by going to http://london2011.drupal.org/ or following us on Twitter @drupalcon. From May 17 - 19, 2011, in advance of DrupalCamp Twin Cities, several Drupal community members met at the University of Minnesota usability lab in Minneapolis to perform a round of formal usability testing on Drupal 7. This is the fourth major usability testing for Drupal, and the first targeting the new Drupal 7 release. The good news is that most of the changes that were put in Drupal 7 tested well. Compared to Drupal 6, Drupal 7 no longer confuses new users with basic conceptual hurdles like where the front-end vs. back-end of their site is and how to create an "About us" page, and for the most part the administrative interface is clear. The bad news is that now that some of these basics have been dealt with, we've uncovered a whole new layer of challenges for first-time Drupal site builders, some of which were pretty surprising. Finding modules, creating and placing blocks, and creating content types were difficult tasks for participants to understand, and it's these site builder tools we'll want to improve for Drupal 8. Eight participants (a typical number for this kind of study) evaluated Drupal by working through a series of real world tasks over a 75 minute period, "thinking aloud" while the team observed and took notes from behind a one-way mirror. The participants could phone a "help desk" (staffed by a member of the team) if they ever got stuck and needed a nudge in the right direction, and a number of open-ended questions were asked throughout the test session. All eight of our participants are people directly in Drupal's target audience. They are site builders, already using tools such as Dreamweaver and WordPress. They know HTML and understand how the web works. All but one had no prior experience in Drupal. In previous usability testing against Drupal 6 and early Drupal 7, we had intended to test things such as CCK, users and permissions, taxonomy, and so on. What we ended up testing instead was how horrifically confused new users were performing even basic tasks within Drupal 6's administrative interface: the separation of front end/backend, the overwhelming number of options at /admin, confusion between Page and Story, and more all stopped people from using Drupal successfully. "there is a lot you can do"
Creating content: All participants—but one—were able to add content (using different links from the homepage) without difficulty. Participants thought it was "pretty simple", "straightforward" and "easy to find 'add content'". Basic Page vs. Article: Participants understood the difference between "Basic Page" and "Article". All the participants who tried to add an "About us" page to the main menu chose "Basic Page". Changing the color of their site: Participants instantly knew to go to "Appearance" to change the color of their site. Although some participants had minor issues finding the theme settings page, they were eventually able to complete the task. Participants also liked how of color changes were previewed live on the affected area itself. Toggle between the administrative overlay and site: All but one participant had a clear understanding of how to toggle between the overlay and the site. Participants understood when they were performing administrative activities and frequently used the overlay's "close" button to return to their previous location or before preparing to start a new task. Now that people can actually navigate and do basic content creation tasks without much difficulty, they encounter other parts of Drupal's administration that are still utterly baffling. This section covers the major issues, though there are many more, some of them quite easy to fix! Terms like "Block" and "Module" and "Content types" and "Triptych" either have no meaning, or a preconceived meaning that is different from what Drupal uses these words for. For example, some think of "module" as a block. The distinction between "sidebar" content and content made absolutely no sense. Content is content. When asked to create a sidebar block, every single participant went for the "Add content" link. Unsure which option to choose, they went for either "Article" or "Basic page" and scoured the vertical tabs options for a way to add it into the sidebar. People really craved some sort of "edit in place" mode as a visual way of controlling their site layout. They tried to click on region names in the block demonstration page to add content there. They tried to take a node that was outlined with the contextual links border and drag it to the sidebar. They tried to click and drag to resize sidebars. The lack of this functionality made Drupal appear extremely clunky. While Drupal takes a "content-first" approach to site building, many people take a structure- and/or appearance-first approach. When looking at a mockup of the website they were trying to build, the natural inclination for several participants was to start setting up the navigation structure first. They ran into issues when doing this, because they were required to enter something for the "Path" field of the menu item they were creating, and they had no idea what that could be. Once a help desk call pointed them at the "Install new module" link, new problems began. Being taken off-site to Drupal.org was extremely jarring, as was the (apparent) requirement to download a module to the desktop and then upload it to the server to install it. People suggested an in-app browser for modules from Drupal.org. Additionally, the filtering options on drupal.org for modules are overwhelming. The search box, arguably the most valuable tool for when you have a general idea of what you're looking for, is located far down the list and was missed by most participants. Instead, they honed in on the "Categories" drop-down, which was completely useless to them. "This was just hard. I struggled with it. I will have my sister help me." "If you know what are you doing, it's okay. But for the first time user, it is a little shaky." "A little confusing at first ... but I think you need to toy around with it ... get familiar with it." "Not as user friendly as I thought." Finally, it is important to note that none of the participants were able to make it through their session without needing at least some assistance from the "help desk". We found over 100 issues during this testing round, some of them major, and many more minor ones. These are captured in raw form in the "Issues Analysis Matrix" spreadsheet, and in the issue queue under the "UMN 2011" tag. We will discuss, design and code changes for these, involving the larger community on what it means to fix them, and how. You are most welcome to join the effort! Provide and review patches for issues with the "UMN 2011" tag. We also encourage you to help with further usability testing, both formal and informal. What we tested at University of Minnesota only scratches the surface of what Drupal core can do (for example, we didn't cover Taxonomy, Search, adding themes from Drupal.org, etc.). We need further testing to verify if our changes are actual improvements, and there are many contributed modules out there that would benefit from usability testing as well. We are proud to announce DrupalCon London's keynote speakers: Tom Standage, The Web Standardistas and, of course, Dries Buytaert. Dries Buytaert, Drupal Project Lead and President of the Drupal Association, will kick-off the conference with his State of Drupal keynote presentation on Tuesday, 23rd August. Dries Buytaert will discuss where Drupal is and where it is going. In particular, he’ll discuss the future of Drupal 8 and give an update on the core initiatives that were set-up since the last DrupalCon. Dries Buytaert is the original creator and project lead for the Drupal open source Web publishing platform or “the reason there is a DrupalCon in the first place”. In addition, he is also the co-founder and CTO of Acquia, a company that offers hosting, technical support, and services for the Drupal platform, and the co-founder of Mollom, a web service that helps identify content quality and stop website spam. Tom Standage, the digital editor at The Economist, will hold a keynote on Wednesday, 24th August. Known for his historical analogies in science, technology and business writing, Tom's presentation will examine the pre-history of social media over the past two millennia and place the construction and use of today’s publishing tools in their full historical context. Besides being a digital editor, Tom Standage is the author of five history books, writes the video-game column for Intelligence Life, The Economist’s lifestyle magazine and is a regular commentator on BBC radio. He holds a degree in engineering and computer science. Christopher Murphy and Nicklas Persson will present a keynote presentation on Thursday, 25th August. The tweed-clad duo will address the role design has to play, and how "fundamental and timeless design principles" are profoundly important throughout the evolution of a project like Drupal. Christopher and Nicklas teach interactive design at the University of Ulster at Belfast, where they have been active in promoting a web standards-based curriculum. As practicing designers and digital artists, their work has been featured in a variety of design books and magazines. Follow The Standardistas on Twitter. Take advantage of the Early Bird ticket price at £255 (+VAT), which ends on 31st May, 11h59pm, GMT+1 (midnight in London, UK). This price includes a ticket to the DrupalCon Party, which you won't want to miss! Conference passes without the party ticket are only ￡230 (+VAT). Drupal 7.1 and 6.21, maintenance releases which fix security vulnerabilities are now available for download. Drupal 7.2 and 6.22 also fix other issues reported through the bug tracking system. Upgrading your existing Drupal 7 and 6 sites is strongly recommended. There are no new features in these releases. For more information about the Drupal 7.x release series, consult the Drupal 7.0 release announcement, more information on the 6.x releases can be found in the Drupal 6.0 release announcement. Drupal 5 is no longer maintained, upgrading to Drupal 6 is recommended. Drupal 7 and 6 include the built-in Update status module, which informs you about important updates to your modules and themes. Both Drupal 7.x and 6.x branches are being maintained, so given enough bug fixes (not just bug reports) more maintenance releases will be made available. Drupal 7.1 only includes fixes for security issues. Drupal 7.2 also includes bugfixes. The full list of changes between the 7.0 and 7.2 releases can be found by reading the 7.2 release notes. A complete list of all bug fixes in the stable 7.x branch can be found in the git commit log. Drupal 6.21 only includes fixes for security issues. Drupal 6.22 also includes bugfixes. The full list of changes between the 6.20 and 6.22 releases can be found by reading the 6.22 release notes. A complete list of all bug fixes in the stable 6.x branch can be found at git commit log. We made two versions of both Drupal 7 and 6 available, so you can choose to only include security fixes (Drupal 7.1 and 6.21 respectively) or security fixes and bugfixes (Drupal 7.2 and 6.22). You can choose your preferred version. We are trying to make it easier and quicker to roll out security updates by making security-only releases available as well as ones with bugfixes included. We hope this helps you roll out the fixes as soon as possible. Read more details in the handbook. The .htaccess file was changed in Drupal 7.2 to allow for simpler server configuration, while the (default. )settings.php just got a minor documentation fix that should not affect any copies. The robots.txt file did not change in Drupal 7. The robots.txt file was changed in Drupal 6.22 to allow crawlers to index the contact page. The .htaccess and (default. )settings.php files were not changed in Drupal 6. When updating to Drupal 6.22, you might loose some of your block configuration. Follow #1173012: Blocks lose settings during update.php and cache clears for more information. If you need to update to Drupal 6.22 and experience this issue in testing, you can roll back the patch from #235673: Changes to block caching mode not caught. Spoon Media has been building Drupal sites for the last 6 years. We generally do mid to large size projects and pretty quickly we noticed how often we were turning away business from companies with modest budgets. That wasn't great for them, because most low budget web solutions are pretty ordinary and it also meant we were sending small jobs elsewhere. This was the main motivation for building Pagebuild - we wanted to let small business get a great website at a inexpensive price but still retain a high standard of product. 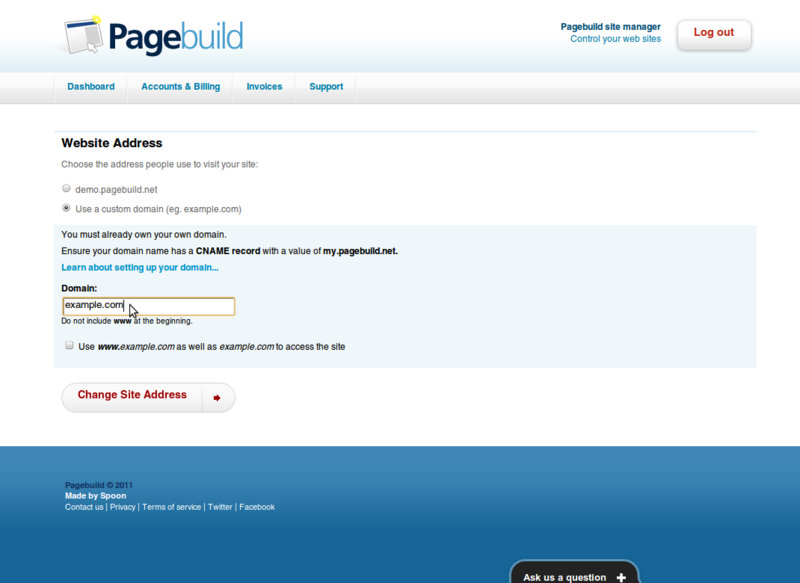 Pagebuild as a product consists of two main systems which we've dubbed front-end and back-end. The back-end is the software that allows customers to signup, create and manage their websites. Aegir is used to provision and manage sites and custom Drupal modules provide a simple customer interface to the site provisioning and management process, as well as the standard account and billing settings. Both the front-end and back-end are powered by their own Aegir platforms. Of course we use a bunch of great Drupal community modules across both systems. More on that follows. jQuery, jQuery UI and a series of jQuery plugins are used extensively. I'll explain the motivations and provide some light implementation details for selected features. It was very important for us that the editor was truly WYSIWYG. It wasn't enough that a heading was a heading and bolded text was bold. We needed headings to be styled exactly the same whether the user is editing a content area or viewing it. As a result we threw out the idea of using IFrame based WYSIWYG editors such as CKEditor or TinyMCE. Another requirement was that users should be able to freely drag and drop images from our Media Manager into the content area. Doing this with an IFrame based editor was not possible. 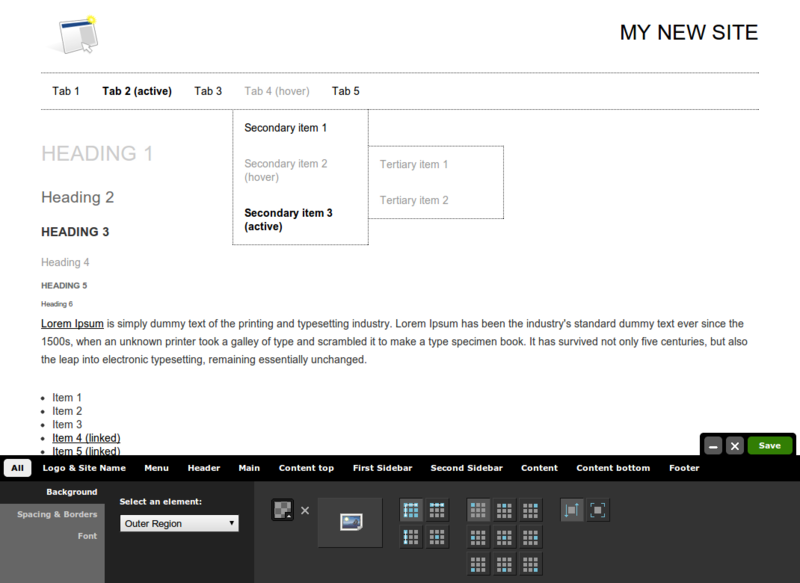 After much back and forth we settled on Twoism's reviser as the base for the WYSIWYG editor. I say base, as significant Pagebuild specific changes were made in order to get it work just so. The result is that we are able to provide a true WYSIWYG editing experience that is completely tailored to the Pagebuild Way. One of coolest features of Pagebuild's editing would have to be the ability to drag images from the Media Manager toolbar and drop them into the content area at a position that makes sense visually. Unlike other drag and drop solutions in web WYSIWYGs, Pagebuild won't allow you drop an image in the middle of a sentence. With jQuery UI's sortable plugin we are able to force the image to be moved around the content area and dropped in sensible drop zones. Of course it's not enough for users to be able to edit the main content area. In order to allow the user to create unique and flexible page layouts we leverage Drupal's regions and blocks to make this happen. When editing a page regions can be shown or hidden, and blocks can be added to regions. This all happens via AJAX, and creating/editing/deleting blocks happens on the page itself to prevent interrupting the editing experience. As an added bonus existing blocks can be dragged from one region to another. When a user selects a theme from the Switch theme toolbar we simply set that theme to be the default for all users, and make sure the block visibility remains the same. I'll talk more about how themes are put together a below. 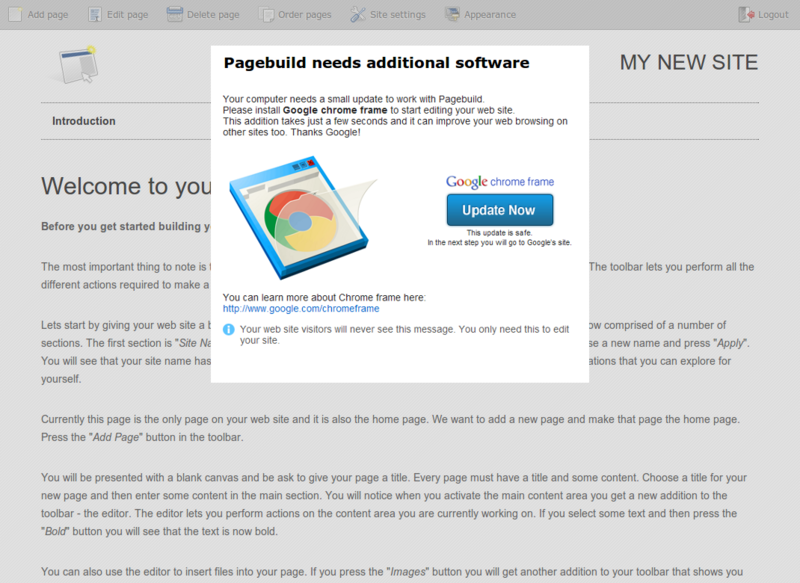 From a customer's perspective the Pagebuild adventure begins with sign-up. Here we capture the customer's details, process the payment and provision the site. We use Aegir to provision new sites automagically when the customer has finished signing up. Aegir, being as wonderful as it is, makes this incredibly simple. All you need to do is create a node of type site, and it will be added to Aegir's task queue. 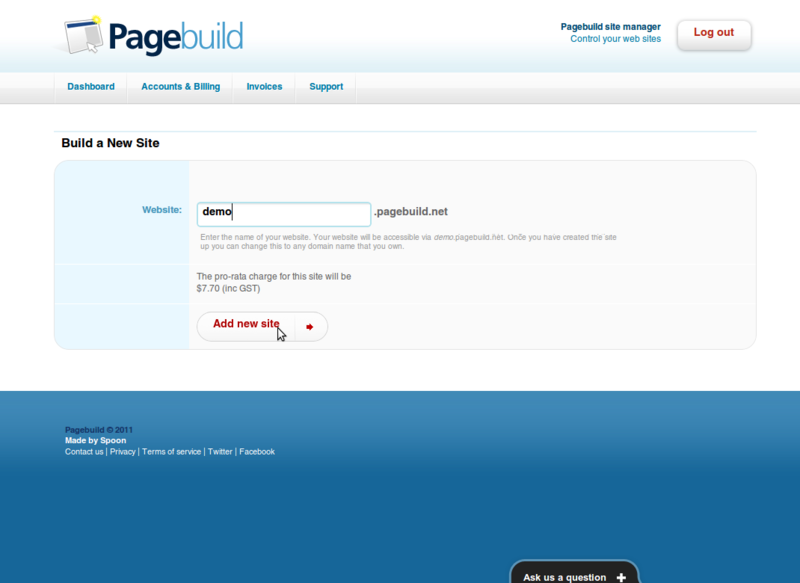 After sign-up the customer is automatically logged in and presented with the Pagebuild Dashboard. Once the site has been provisioned (which usually happens inside of 60 seconds) they can login to it and start editing right away. In order to implement a Single Sign On the back-end acts as an OpenID provider. Our custom Drupal install profile adds an entry into the authmap table allowing them to login to their site without having to re-enter their login details. The custom Drupal install profile on the front-end communicates with the back-end database to setup themes, roles, filters, pathauto and imagecache settings, amongst other things. Once a customer has signed up they can add new sites to their subscription with a simple single page form. When a customer first signs up they are asked to enter a subdomain for their website. 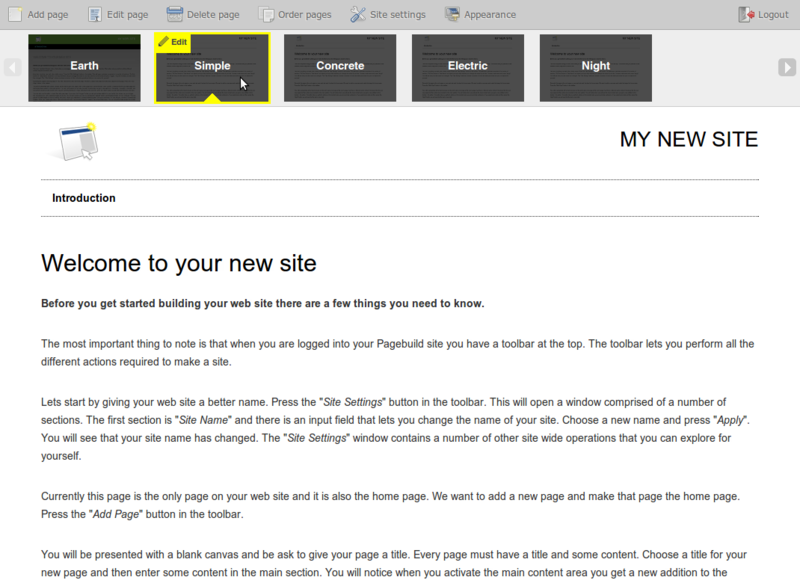 Initially the site is provisioned as example.pagebuild.net. Once the site is provisioned though, the customer has the option to use any domain of their choosing for their site. Again Aegir makes this very simple. When the customer submits the form we check that the domain they have specified points to our IP address. This prevents the site from being unreachable if the A record doesn't match. Once we've checked the A record points to the correct IP address we create a migrate task in Aegir, which goes off and renames the site. Customers are able to choose from a set of free themes or they can make their own theme. Using one of our themes as a starting point, the user can alter every aspect of the design from their browser. They can then save their theme with a new name, effectively forking it from the pre built theme we provided. This concept is used in both Drupal Gardens and in the Sweaver module, however both of those implementations allow so much freedom as to be confusing to a non technical user. We have taken the concept and made it harder to do silly things to your theme by restricting what HTML elements you can actually modify. Whilst this limits the power of the theme editor, on the whole it results in a better theme when used by a novice. While we provide free themes for customers to use on their site, we also provide them with a service whereby they can purchase a customised design. This is not automated and involves the customer talking with a designer to get a result. Using the token module we replace the Pagebuild theme tags with the Zen markup required to make sure the theme works with the Pagebuild editor. Designers upload the template file, a CSS file and whatever images are required and a complete Zen subtheme is automatically generated and copied into sites/all/themes ready for use. The permissions on individual theme nodes ensures the theme is available only to the customer who purchased it. Custom themes are currently only available to designers we have an existing relationship with. In the future we plan to open this feature up to more designers. Further down the track we will open the feature to customers themselves. Initially we tried using Ubercart, uc_recurring and various payment modules for the checkout and subscription payments. It turned out this added an unnecessary layer of complexity to the system. The Ubercart product wasn't meshing well with the existing Aegir and Pagebuild CCK types. Eventually we replaced the whole thing with a simpler custom built payment and subscription module. The uc_hosting module to integrate Aegir and Ubercart looks promising, but we needed to move quickly, and rolling our own system allowed us to do that. 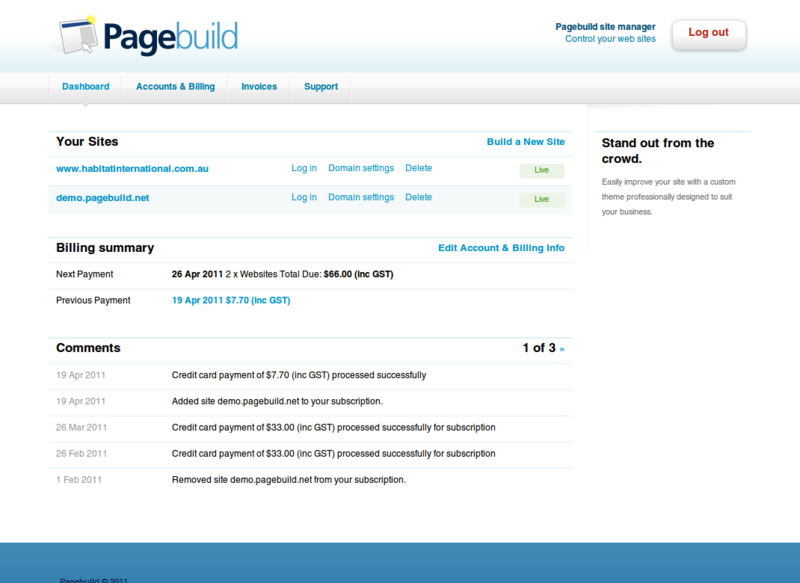 Another benefit is that the payment system is tightly integrated with the rest of the Pagebuild system. This allowed us to do exactly what we need to do without working around the assumptions inherent in Ubercart, uc_recurring and the payment modules. 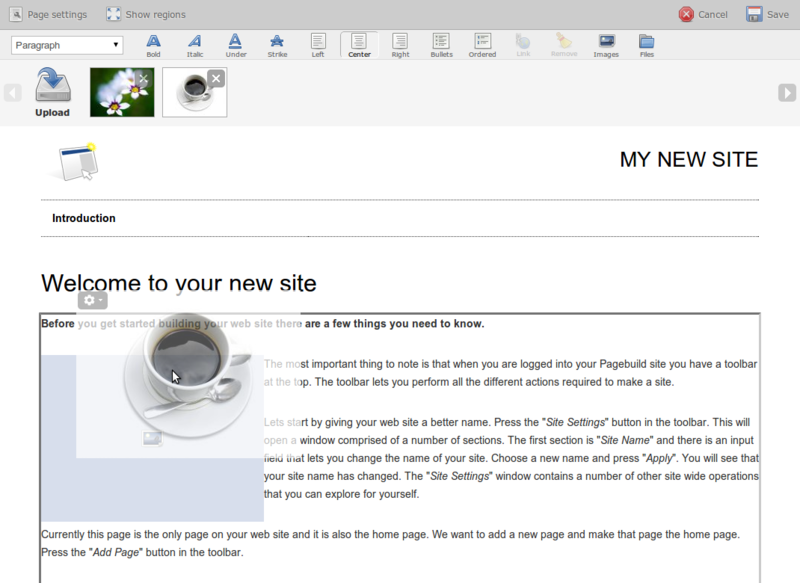 The the first half of development we aimed to support IE7+ for page editing. After considerable effort we decided to ditch native IE support, and instead create a simple UX for the customer to install Google Chrome Frame. We are really pushing the limit of WebKit and Gecko browsers when it comes to building WYSIWYGs, and we decided that a superior experience was preferable to a lowest-common-denominator one. The UX we provide for customers to install GCF is as simple as possible, and we doubt it will deter customers. Of course, GCF is only required for customers when editing their site. 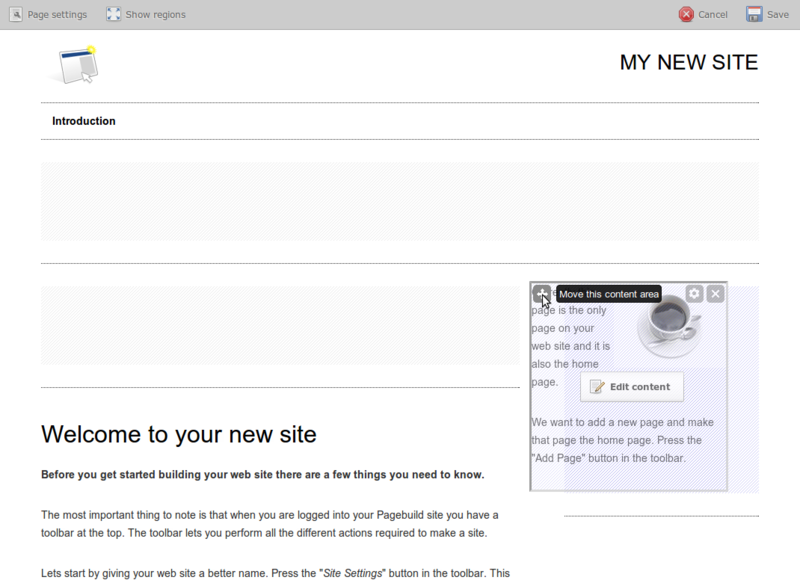 We support IE6+ as well as the proper browsers when viewing Pagebuild sites. 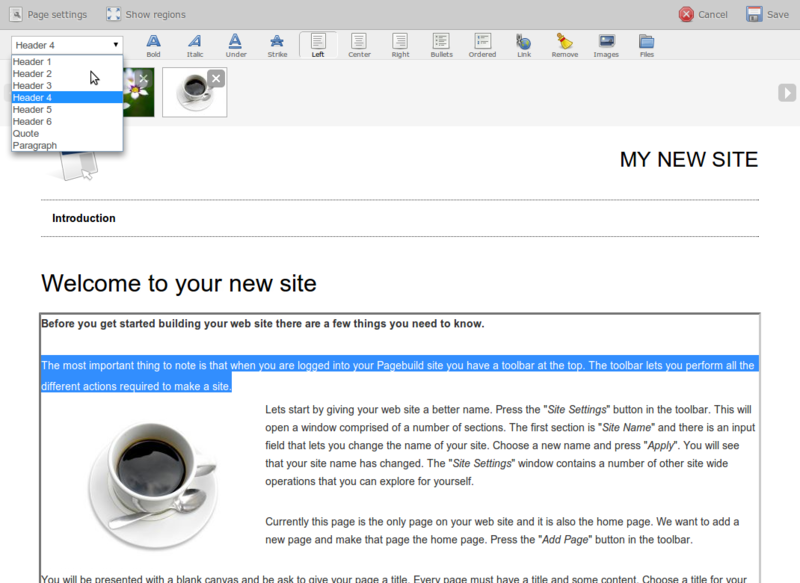 Instead of using an IFrame based WYSIWYG editor we decided to use a feature of some browsers called content editable. While we believe this provides a superior editing experience, the cost is in the fact that it is not uniformly supported across all browsers. Worse, some implementations are particularly bad. Anecdote alert: In order to fix a bug caused by Firefox's implementation of document.execCommand we were forced to build a debug binary of Firefox and step through the rendering code in gdb. Despite the additional effort required in rolling our own WYSIWYG editor, we are very happy with the experience we've managed to produce. We are really interested to hear what people think about it so please leave us a comment and we will reply. We are constantly developing the product (we roll a new release weekly) and so genuine feedback is really helpful and may even end up becoming part of the product. With the Drupal community growing so quickly, building your skills is more important than ever. We want these courses to help the community provide a broader range of services, employ the most innovative and efficient practices, and allow Drupal (and the Drupalists!) to excel. Whether you're new or experienced with Drupal you can always gain from some hands-on training. We have instructors coming from Canada, U.S. and all over Europe to share their expertise. Prices range from £150 - £325. These courses are an affordable way to round out your DrupalCon experience. Keep in mind, the early bird registration deadline is the 31st of May! We hope you'll find something for everyone on your team, and that you take this unique opportunity for intensive professional development. We'll be posting further details in the coming week! We'll have more information about the training providers and the learning objectives for each course. Absolute Beginner's Guide to Drupal - £150! (+VAT) Sign up today! Learn the fundamentals of working with Drupal. Making the Switch to Drupal: The developer's view - £250! (+VAT) Sign up today! Learn how to read the blueprint before using your saw. OpenPublic, build websites for government - £325! (+VAT) Sign up today! Want to Build Sites for Government? Learn to Build Better and Faster with OpenPublic. Theming for Non-Themers - £250! (+VAT) Sign up today! Learn how to create amazing looking sites in Drupal with no code. Advanced Configuration with Views, Page Manager, Flag and Rules - £325! (+VAT) Sign up today! Learn how Drupal works, how to implement hooks, and working with databases and Form API to extend Drupal. Building Modules for Drupal 7 - £325! (+VAT) Sign up today! Drupal 7 SEO - £325! (+VAT) Sign up today! Learn on-page optimization to get the best search engine placement for your site. Drupal Performance and Scalability - £325! (+VAT) Sign up today! Learn the best practices for tuning and scaling Drupal sites. Aegir Hosting System: Deep Dive - £325! (+VAT) Sign up today! Learn a scalable solution for deploying and managing Drupal sites. Creating Awesome UX Deliverables - £325! (+VAT) Sign up today! Learn to develop and communicate a UX Vision, employing best practices and patterns. Drupal Powered E-commerce - £325! (+VAT) Sign up today! Learn to build e-commerce functionality in Drupal. jQuery for Drupal - £325! (+VAT) Sign up today! Rich and interactive user interfaces. Learn to build them with this Drupal-jQuery course. Despite Melissa Anderson (eliza411)'s low user number on Drupal.org, she was a relatively quiet contributor until about halfway through the Great Git Migration, when she took over as project manager of that huge undertaking. Melissa’s scope, focus, and competence [editor’s note: a dreadful understatement!] continue to amaze everyone, and she is generally accepted as a fundamental reason that the Git Migration was completed on schedule and to such great reception. Hailing from a small Alaska town with a background in education, Melissa is now officially co-lead of the Git Project with Sam Boyer. Randy Fay, Sam Boyer, and the entire Git migration team have nominated Melissa in honor of her incredible contribution. I needed a solution for managing information in a public way. I tried Postnuke, but it was a complete #fail. Some very interesting friends recommended Mambo (now Joomla) and Drupal. In the early years I wasn't involved in the wider community - I just got my own work done in the issue queue and forums. When I moved to Portland, I got involved in the Drupal User Group, and when Andrew Morton (drewish) left town, he left me and Jonathan Hedstrom (jhedstrom) in charge of it. I'm still doing that. How did you end up being the Git Migration project manager? I had been project managing and site building for some time and was ready for a change. Chris Strahl had planned to manage the Git project, but got hired by Acquia and disappeared to Africa. Same basic kind of thing, he was leaving town and asked me if I knew anyone who might take it on. :-) I thought it seemed like an interesting problem to solve, so I signed on. I guess I have a habit of standing around and looking approachable. And people hand big projects to me. At Drupalcon, Chicago you and Michael Halstead had the highest-profile wedding ever held at a Drupalcon. Can you tell us a little about how that came about? Michael and I had been a couple for several years, and we’d talked about marriage. After the Git migration, we felt if we can get through the Git migration together, we can survive anything. And we had lots of friends there. Just the week before Drupalcon, we decided to go for it. How did you come to have the obvious project management skills you have? Is that your profession? I’ve been building web sites and managing web development projects for the better part of the last 10 years, though. Is it true that you brought former students into the Git migration project? I have former students with myriad tech backgrounds, and it was awesome to be able to work with two of them again on this project. It’s been a pleasure to keep in touch with former students and follow their progress and success, and on occasion, work together to make things happen. I grew up in Delta Junction, Alaska, population 840. We had no running water or electricity and lived in a basement made out of styrofoam. When it got cold enough to freeze the diesel fuel, all the neighbors came to our house because it was the only place that wasn't frozen. At 16, I left for the warmer climes of the lower 48 to study education. What is next for you now that the huge commitment is over? I'm now officially co-lead of the Git team, with Sam Boyer. The Git team is kind of a prototype of the new D8 core initiatives, with two leads, one almost explicitly a manager. I'm still working with others to iron out some of the big technical and community decisions but am starting to work on other things, too. I'd like to add an Agile workflow-oriented interface to the issue queue so that it's easier to organize sprints, especially work that may cross module boundaries. Tagging doesn't really do the trick. I'm also working with Derek Wright on the project-maintainer interface in the project module (the part that project owners interact with when managing code, releases, maintainers, etc., on the project page on Drupal.org). What do you see in the near future for Git in Drupal? Well, there are some key blockers before we can get to the good stuff, the most significant being the need for real, representative development and staging areas so we can have some confidence that we won't negatively impact Drupal.org when doing a deployment. But then comes some really exciting work, like per-issue repositories and a much more integrated repository viewer. Thank you, Melissa, for what you've already contributed and for your future work. The whole Drupal community appreciates your great accomplishment in managing the Git migration. Submit Your Session Proposals for DrupalCon London 2011! There are 9 days left to submit your session proposal for DrupalCon London 2011, which will be held August 22-26, 2011 at the Fairfield Halls in South London. This is your chance to share your knowledge and experiences with DrupalCon attendees. Deadline for session submissions is 15th May, 2011 at 11:59 GMT+1. Check out what others have proposed so far. There will also be a separate "Core Conversations" track, which will open session submissions next week. Make sure to also read the Speaker FAQ, which has information on the timeline for session selection process and other tips. Also, for the first time, selected speakers, giving a full session, will receive free admission to the conference and the opening party on Tuesday night. To be able to submit session proposals you need to register. Once you're registered, you'll have the opportunity to purchase your conference ticket and sign up for the DrupalCon London opening party. If you already have a drupal.org user account, you can use it to automatically sign in to the DrupalCon website. The Early Bird price is at 230 GBP and will last until May 31st. After that, ticket prices will increase to 280 GBP. All tickets are subject to 20% British VAT. You can keep up-to-date with the latest information about DrupalCon London by going to http://london2011.drupal.org/ or following us on Twitter @drupalcon. Some of Drupal's major contributed modules will also gain, including extending the current "Materialized Views" API, help Aegir move to a 2.0 release, improving rules 2 etc. If you would like to keep up to date on Summer of Code happenings, would like to volunteer to help test students' projects, and/or would like to help students as they find their way in our community, please join the SoC 2011 working group and help out in whatever ways you can.